Sunflowers and weddings seem to go hand-in-hand. They are both rich in history and meaning, symbols of a brighter present, and future yet to come. Additional cultural and religious meanings have the sunflower as a symbol of adoration, loyalty and longevity — all good traits for a wedding theme! We looked at a Google Trends graph for our mason jar & fireflies invite post to see if the popularity of that trend continues. Unfortunately, the trend seemed to have peaked in 2013. However, as you can see from the graph below the sunflower wedding trend is back bigger than ever! Sunflower weddings seems to be a perennial favorite among brides, topping out at Google’s highest point scale of 100 in each July of 2010, 2012, 2013, and again here in August of 2017. We didn’t need to tell you that now did we? The only other hard evidence I have of the sunflower trend is the fact that we continue to see sunflower adorned cakes, sunflower bouquets and floral arrangements, and lots of real sunflowers scattered in our featured weddings. Take a look at a few good example real weddings below to see what we mean. 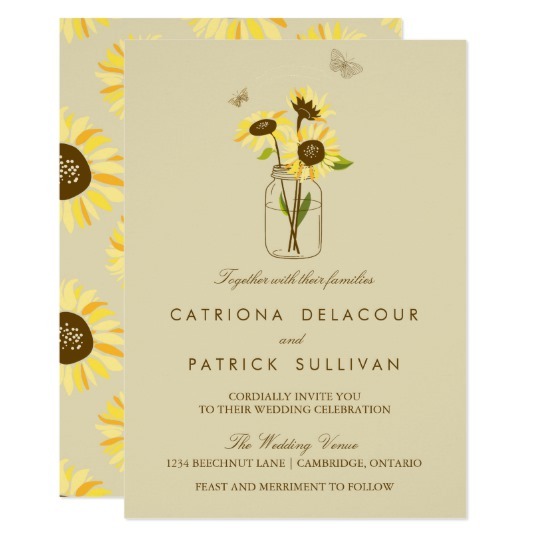 Let’s take a look at some of the best sunflower themed wedding invites we’ve come across from popular online stationery sellers. 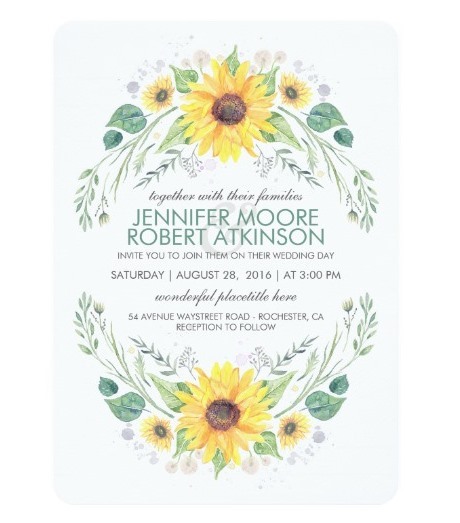 There is a huge number of designs and details when it comes to sunflower wedding invites online. We looked across different individual stationers like Minted and BasicInvite, as well as Zazzle, Etsy, and other popular invite companies to find our top picks. It seems that sunflowers lend themselves to good design ideas and inspiration! A framed sunflower design like this works nicely for a whimsical or rustic wedding. 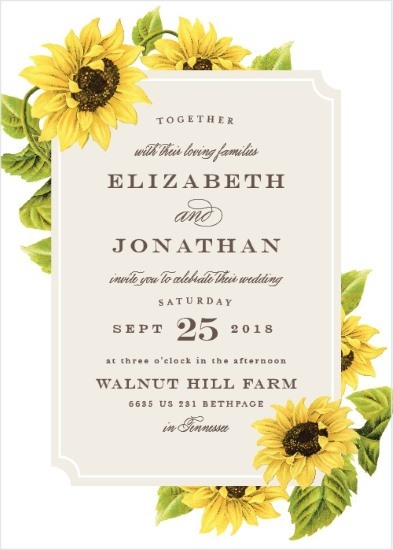 Basic Invite has done a good job of balancing different fonts with the sunflower motif. 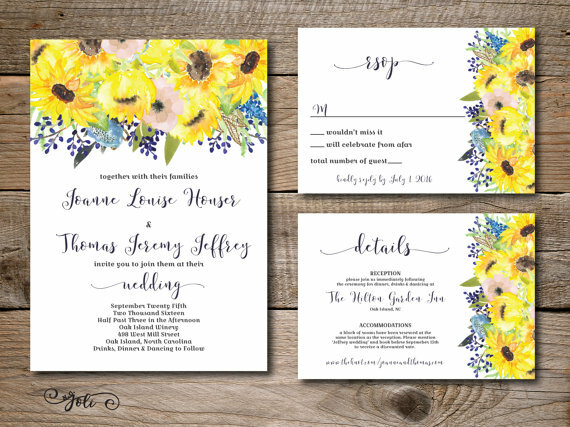 Of course you can customize the text and font choices to your own desires, as well as add matching table numbers, place cards, menu, RSVP cards, and more for a fully cohesive sunflower stationery theme. A designer from Atlanta delivers a whimsical take on rustic woodland nature. 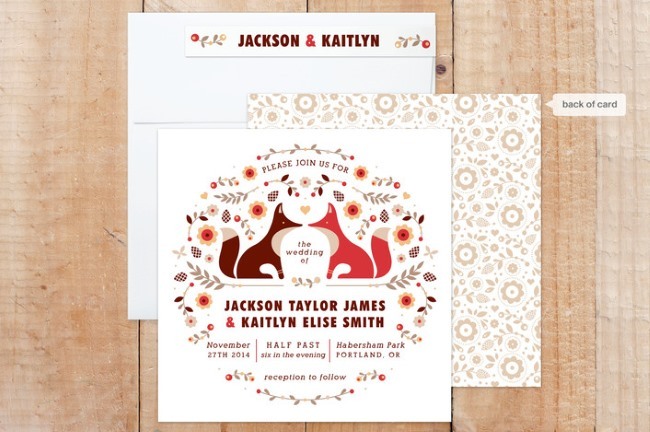 We love the cartoon feel of this design that features foxes, sunflowers, and pine cones among other things. 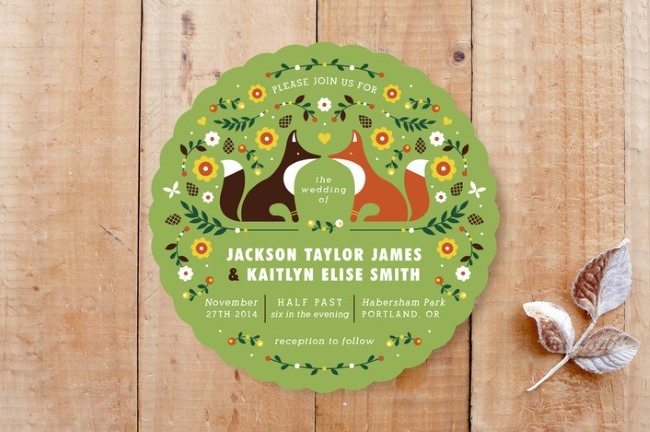 The flower shape edge and round circular format make for a very unique invitation. If you are considering adding sunflowers as an accent to a rustic wedding instead of an overall wedding theme, then this invite may suite you well. Note on color: If you don’t like the green grass color pictured above, you can always customize it to suite your taste! There’s a simple appeal in this vintage sunflower and mason jar invitation. 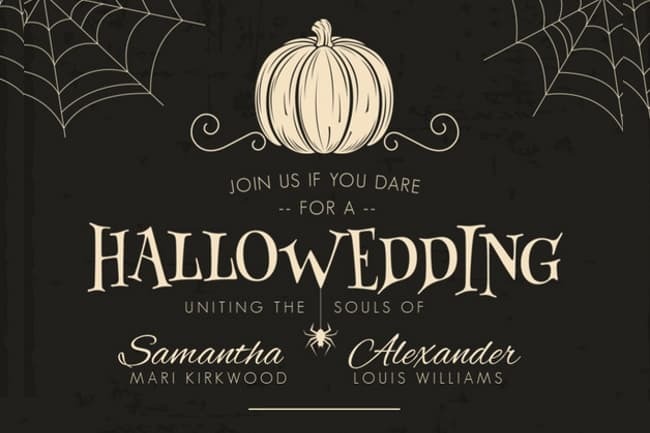 Rustic whimsy and a laid back country wedding should be expected when you send out this invitation. Up the appeal by choosing a rounded or scalloped edge instead of the normal square edge. Or fore a more luxurious feel and tone, select a thicker paper weight. Can’t find that special sunflower invite? Go for one of the most recognized sunflower paintings of all time: Van Gogh’s series of sunflower oil paintings. 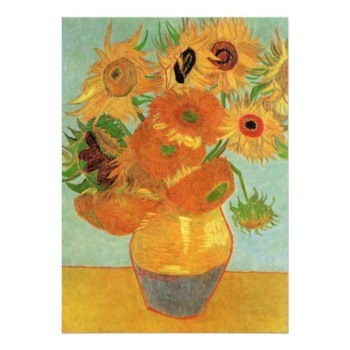 One of the original sunflower paintings was reportedly sold at auction in 1987 for nearly $40 million! We like the artistic watercolor rendition of sunflowers and other green foliage that creates an encapsulating wreath. Boho chic and rustic weddings will feel at home sending this card to guests. Customization options include different shapes and the ability to add photos and text to both sides of this flat card at no extra charge. Another wonderful watercolor design we found, this time from an Etsy designer who has a superb 5-star rating with many reviews. 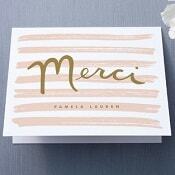 Bold colors and artistic rendering jump off the invite to provide a well rounded stationery suite. 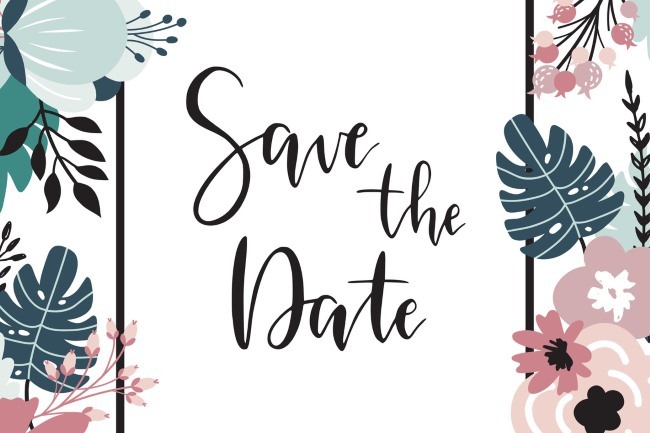 This listing is for a DIY printable wedding invitation and rsvp card that you can print yourself or send to a professional printer. The three real weddings below are inspiring examples for how to use real sunflowers in your bouquets, as centerpieces, decor, or on your wedding cake. There are so many great ideas when it comes to using sunflowers on your wedding day. This Backyard Farm Wedding’s got a ton of Real Sunflowers!